Feeling sniffly and sore? Herbal remedies and acupuncture can help relieve symptoms of sinusitis this Spring. The paranasal sinuses are hollows formed by the bones of the face, which when healthy are filled with air, allowing us to breathe deeply through the nose. The main sinuses are the frontal, which sit in the forehead, and maxillary, which sit under each cheek bone. In the sinuses, mucus production – the body’s reaction when it mounts an immune response – can quite readily become a painful problem if we are unable to drain the mucus faster than it is produced. Inflamed sinuses are prone to infection, meaning viruses, bacteria, fungi and other pathogens such as moulds can readily grow in a sinus cavity full of phlegm. Too many of us are familiar with the uncomfortable, sometimes debilitating ache of a sinus headache and associated symptoms. Without appropriate treatment, or if our systems are incapable of an adequate immune response, the problem can become chronic. Generally sinusitis is classified as chronic if it lasts 10 weeks or more. If your system is prone to overactive phlegm production, sinusitis may become an ongoing problem. It’s possible to improve your immune response and relieve the symptoms of sinusitis so that it is less likely to recur. Acupuncture treatment for blocked sinuses can offer rapid relief. A combination of local points to offer symptomatic relief, and distal points to help open the channels that run through the sinuses and boost the immune system, can help relieve a current infection as well as reduce the likelihood of recurrence. I often refer to the point on the outside of each nostril (Large Intestine 20) as the acupuncture party trick for sinus congestion. More often than not patients arrive at the clinic blocked up, and after half an hour of acupuncture treatment are breathing readily through both nostrils. Pressure point massage at home may also provide some relief for sinus headache. Apply firm pressure to the points at the base of each nostril with your fingertips, along with the points surrounding the eyes and along the eyebrows and cheek bones. Be careful not to press too hard as you will already be aggravated with the pressure of blocked sinuses. Along with acupuncture, herbal medicine is prescribed in traditional Chinese medical treatment to relieve congestion. Magnolia flower, angelica root, xanthium fruit and wild peppermint are classically indicated to open the sinuses. A registered and skilled herbalist will modify each formula to suit the individual with the aim to address the root cause of the sinus problem as well as provide relief for immediate symptoms. As a general rule, when treating active sinusitis and aiming to prevent recurrence, dietary focus should be on avoiding foods that are known to produce phlegm. The usual culprits include dairy, sugar, processed carbohydrates and caffeine. Avoid very spicy and greasy foods as these can accumulate heat and blockage in the system, leading to phlegm. By the same token, avoid cold and raw foods and drinks as these can weaken the digestive fire and result in food accumulating in the system, leading to dampness and mucus production. It is imperative to stay well hydrated. A large percentage of headaches are due to dehydration, and the sinus pressure will only be made worse if your body is dried out. The human body is comprised of 60% water and it’s essential to replenish what we lose each day through regular bodily functioning, breathing, exercising and metabolism. Staying hydrated allows the system to flush out pathogens present and discourages formation of mucus. 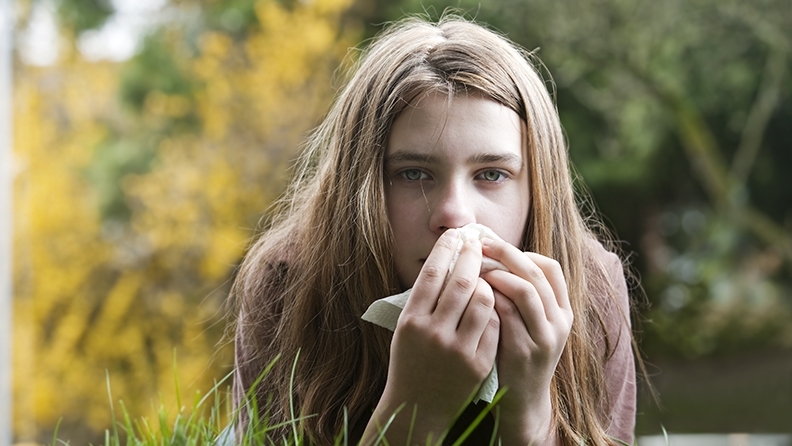 With springtime comes common cold and allergen season. The air is heavy with pollens, which can lead to allergic sinusitis, and the increased wind and rain also spread more pathogens. Coming into spring, ensure you’re dressing appropriately to protect against blustery weather, eat plenty of vegetables and limit sugar and processed food, exercise regularly, and make sleep a priority. If you suffer from sinusitis or other mucus-forming problems, follow the dietary advice above, limit alcohol, and if you smoke, stop. Importantly, if you suffer sinus problems seek treatment and advice from your healthcare provider. Chronic sinus headaches need not be an ongoing problem.